A nest boxes is a man-made structure in which birds nest. Most people use the term "birdhouse" to describe a man-made structure in which birds nest. A more appropriate term is "nest box" as the box serves birds as a site to nest. 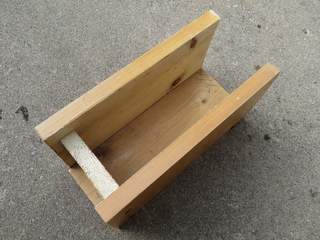 A nest box is generally enclosed on all sides as well as the top and the bottom. Entrance to the nest box is usually a hole. The kinds of birds that use nest boxes are known as cavity nesters. Their natural nest is normally in an existing cavity found in a tree. An example of a natural cavity would be an old woodpecker nest or a rotted out cavity. Dead trees generally have more cavities in them as the wood becomes soft with time. Unfortunately dead trees are not commonly found in our landscapes, but nest boxes can be used to replace or supplement natural cavities. Backyard cavity nesting birds include our native bluebirds, chickadees, titmice, woodpeckers, flickers, great-crested flycatchers, and screech owls. Native cavity nesters found in more rural areas also include tree swallows, wood ducks, kestrels, and barn owls. The introduced house sparrow and European starling also nest in cavities and negatively compete with our native cavity nesters. Do not allow them to nest in birdhouses as they compete negatively with our native birds. Learn more about Cavity Nesting Birds. The design of the nest box is crucial for monitoring nesting species. The box must be easy to open. 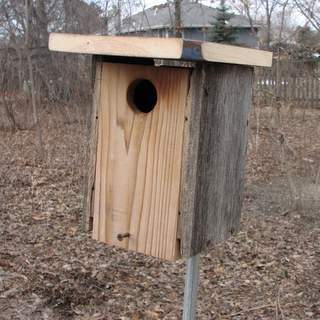 Use a front opening nest box for all species except woodpecker. Woodpecker nest boxes should be top opening. The design should allow trapping house sparrows and starlings which compete with our native birds. Both the front and top opening boxes work well with nest box traps. A front opening box has two screws near the top of the front that act as a hinge when the box is opened. The screw at the bottom front secures it to the nest box. A top opening box is necessary for woodpeckers as the nest boxes must be filled with aspen shavings and are much deeper than other nest boxes. A front opening nest box would cause the aspen shavings along with the nest to fall out. I use two screws mounted diagonally to fasten the roof to the box. 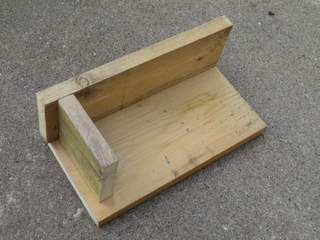 A nest box with a flat roof is easier to construct than a nest box witha slanted roof. The flat roof should overhang all sides of the box and drip lines should be cut on all sides of the bottom side of the roof. This will prevent water from seeping into the nest box. The floor should be recessed into the sides. I do not include drain holes as the key to a dry nest is a roof that doesn't leak. 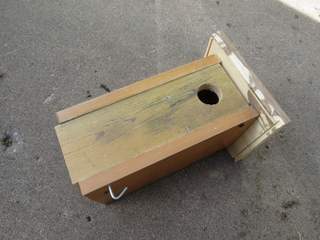 The board with the hole in it should be roughened on the inside to allow young birds to climb to the hole for feeding and fledging. 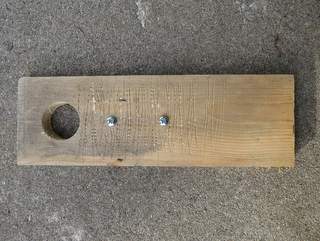 Scoring the board will create a roughened surface that birds can cling to. I use a flat head screwdriver to scratch the surface by making horizontal lines spaced about a quarter inch apart. The outside front board should be roughened to allow adult birds to cling to the house when inspecting it and feeding the young. Monitoring Front is opened to see inside nest box. May be difficult to see contents of the nest, especially when the nest fills up the nest box. Top is opened to see inside nest box. A step ladder may be necessary to look into the box. It offers the best view of the nest and its contents. Construction Two screws act as a hinge and one screw keeps the door fastened. Two screws keep the roof fastened. To check the nest box, remove one screw and pivot the roof on the other screw. Photography Difficult to photograph nest and contents. Easy to photograph nest and contents. I've researched recommended sizes for nest boxes and different sources give different information. I find that most literature recommends boxes that are larger than the species prefer. Birds like to feel secure in their nest box. Roomy nest boxes are not necessarily preferred by birds. My dimensions are also based on finished lumber sizes. Using finished lumber sizes allows minimal cutting. The least expensive wood to use for building nest boxes is white pine. It is readily available in 1" thickness and even sized widths. Lumber sizes are the dimensions of the lumber before it is finished (planed smooth). For example, a 1 x 4 after planing is ¾" thick and 3½" wide. 1" x 4" ¾" x 3½"
1" x 6" ¾" x 5½"
1" x 8" ¾" x 7¼"
1" x 10" ¾" x 9¼"
For smaller birds, my favorite size nest box has an interior floor dimension of 3½ X 4 inches and an interior depth of 9 inches. This size will accommodate the largest number of species. The most useful birdhouse hole size for smaller birds is 1½ inches in diameter. This size will allow wrens, chickadees, titmice, bluebirds, and swallows to enter, but will exclude the larger starling. The 1½ inch hole will unfortunately allow house sparrows to enter the nest box. For chickadees and house wrens I recommend a 1 1/8" hole to prevent house sparrows from being able to enter. Starlings and house sparrows must not be allowed to nest in nest boxes. Nest boxes are attached to either a 5' length of ½" or ¾" EMT conduit depending on the size of the nest box. 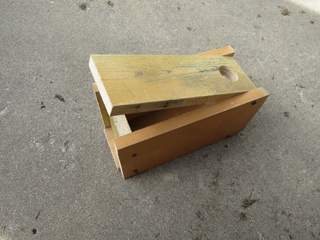 The method of mounting nest boxes is as important as the nest box itself. Use the following table to determine the method that the box is mounted. The box conduit size and mounting height will determine the method used for mounting the nest box. For detailed instruction on mounting various kinds of nest boxes see Mounting a Nest Box. Building your own nest boxes is not difficult. Cut lumber to proper dimension for desired nest box. Nest boxes must be monitored. They should not be put in place and forgotten. Unmonitored nest boxes become homes for pest species like house sparrows and starlings. If you aren't willing to monitor your nest boxes, then you shouldn't put them up. Our nest boxes should help our native birds, not hurt them. By checking nest boxes regularly, problems can be rectified. The method used to mount nest boxes is very important to aid in monitoring nest boxes. Some nest boxes can be mounted at 5' high which makes them easy to monitor. Some birds require a nest box to be mounted at 10'. When mounting at this height it is best to use a telescoping pole. This allows you to monitor the nest box without using a ladder. 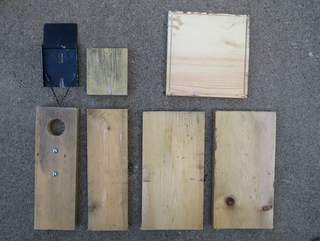 Learn more about Mounting a Nest Box.